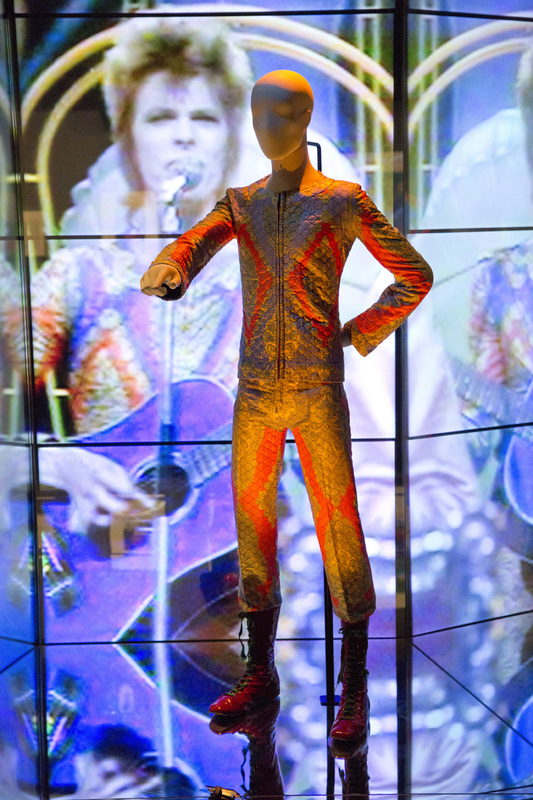 I remember that David Bowie Is… a touring exhibition from the Victoria and Albert Museum that will be at ACMI in Melbourne from 16th July and 1 November. Not that I’ve seen the exhibition, I remember seeing the exhibition in the film. My brain felt like a warehouse… the lyrics sheets of familiar songs, the photographs, models of stage sets, over 50 costumes, memorabilia and lots of videos. Russell Briggs, Head of Exhibitions & Collections at ACMI described the media preview as “a Russian doll, a film of an exhibition of a biography…” There are a lot of Russian doll aspects to anything about Bowie, the actor playing an alien rock star, as you unpack one doll it is revealed to contain another and another. And David Bowie is hyperreal, he is more real in simulacra than actually. During the film I remember thinking that blockbuster exhibitions and stadium rock have a lot in common and even with the audience for the exhibition capped at 200 visitors per hour the experience will be similar. Do I want another experience like Bowie’s Serious Moonlight concert in a packed (40,000+) at VFL Park, the Waverley Football stadium? From my position in the stands I saw most of it on the big screen, so maybe it would have been just as good to have watched it on TV. Andrew Peacock, the then Liberal opposition leader was also in the audience and Bowie was going through a 50s retro phase. Even though they are on the cutting edge there is something conservative about successful trend spotters, like Bowie. The exhibition does over hype Bowie and it would like you to forget that Bowie with Mick Jagger ever sung a cover of “Dancing in the Streets”. I’d like to forget that too but having seen it I can’t. After watching David Bowie Is… (the movie) and during the writing of this post I avoided listening to any classic Bowie hits and restricted myself to an aural diet of his soundtrack for Labyrinth, the Laughing Gnome and Rubber Band. I started to wonder if Bowie hadn’t changed the whole history of the novelty song; taking it from a statistical minority of pop songs to the majority. 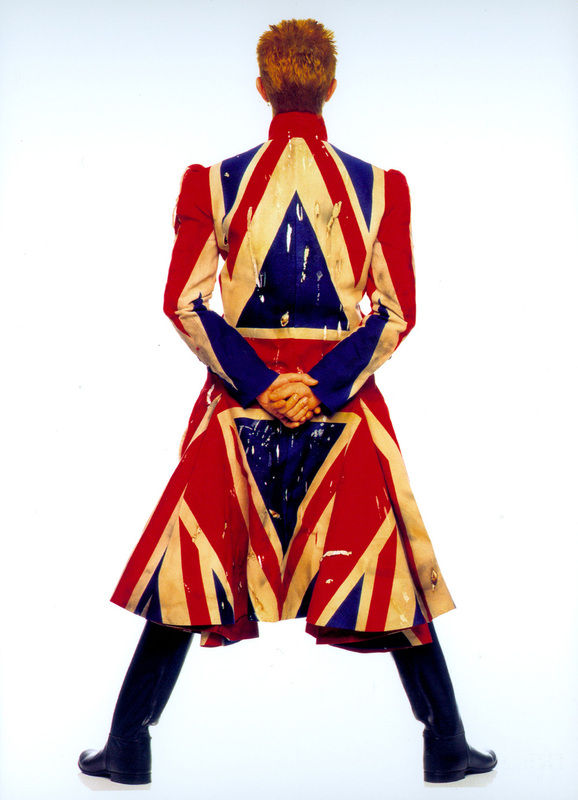 But remember that with all this novelty Bowie demonstrates the art/politics of constructed identities. The constructed identity is opposed to both the idea of a given or a natural identity and this is a very important contribution that liberated many people. The diversity of Bowie’s artist practice, from actor to visual artist defies assumptions about work and identity, but also a celebrity art practice in the role of producer/director and collaborator. But does this qualify as genius? The discourse on this subject and the greater discourse around Bowie is another layer of Bowie’s much vaunted collaborations. The absence of Bowie is significant, the long periods between albums, the points where his only presence is in the public discourse about his career. Along with the exhibition there will be a two day symposium on The Stardom and Celebrity of David Bowie, presented in partnership with The University of Melbourne and Deakin University with the support of the Naomi Milgrom Foundation. David Bowie Is… would like to define how David Bowie will be remembered, a creation of art and design. I expect that in 2050 a scholarly book on the history of a century of rock music will be published but how many references to David Bowie will there be in the index? It depends on the way that author tells the history. If the book is about popularity, the mass effect of rock music or icons of rock then there may be a many references to Bowie. If the book is about the development of rock then there may less; there is only one reference to Bowie in the index of Greil Marcus’s Lipstick Traces.